India woke up to the news that Indian Air Force has carried out a surgical attack on Pakistan as revenge to the February 14 Pulwama attack, which killed 40 Indian soldiers. At the wee hours of Tuesday, February 26, Indian Air Force crossed the Line Of Control (LOC) and entered Pakistan and carried out multiple attacks. Many celebrities have come forward to salute the Indian Air Force and their brave attack on Pakistan. 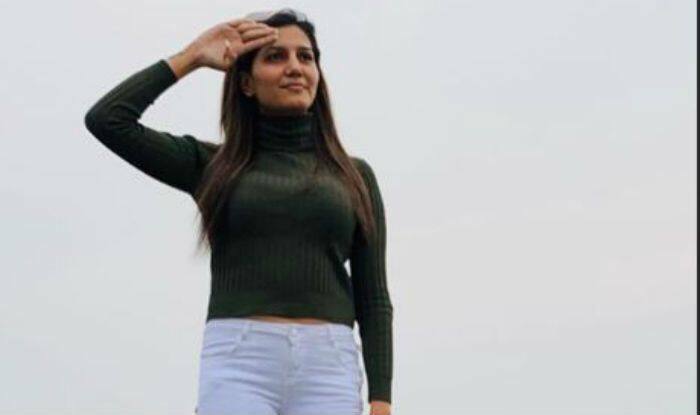 One of the messages was from the Haryanvi hot dancer and singer Sapna Choudhary, who proudly stood on the car and salute the Indian Air Force. She took to Instagram to share a picture and captioned it as ‘Bharat Mata Ki Jai’. Indian Air Force sources have said that multiple Mirage 2000 Indian fighter jets carried out attacks on the terrorist camps across the border. The targets were terror camps and launch pads of Jaish-e-Mohammad (JeM) among other terrorist groups, the source said. Reports stated that the strikes involving several fighter jets of the Indian Air Force successfully destroyed camps belonging to Pakistan-based terror outfits of JeM, Hizbul Mujahideen and Lashkar-e-Taiba in Balakot in Khyber Pakhtunkhwa province. On the work front, Sapna Choudhary has been looting hearts with her super-hit songs like Teri Aakhya Ka Yo Kajal, Chetak and Tu Cheez Lajawab. Sapna recently made her debut in Bollywood too with the movie Dosti Ke Side Effects but it did not do well at the box-office. The film also stars Vikrant Anand, Zuber K Khan, Anju Jadhav, Neel Motwani and Sai Bhallal.